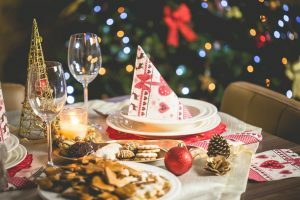 When it comes to Christmas, most will go the whole hog when it comes to decorating the living room but when it comes to the kitchen; now here’s where the real challenge comes. Not only will adding a bit of Christmas magic, help to create a sense of continuity throughout your home but it will make your kitchen a special place to spend your evenings and spend time with your family in the run up to Christmas. Kitchens Anglesey use some tricks that keep the Christmas theme abundant in every area of the room. Christmas candle display – This one is a super easy way to make your kitchen more Christmassy in seconds. It’s time to pull out the candlesticks because if there’s one time of the year they’re appropriate, it’s now. Create a small display if you like in the centre of a table by filling a vase or glass bowl with some left over baubles to continue the theme from your living room. Pinecones, mistletoe & holly –Bring the outdoors in and arrange some pinecones and dried holly around your candlesticks and cabinet displays. If you really want to put a modern twist in it, you can spray paint your pine cones to suit you kitchens colour palette. If you’re already in love with the decorations you have, you can make a bit more of a festive feel by adding some red, gold or silver coloured ribbon around your candles, plants and lampshades. Fairy lights – Now the nights are drawing in earlier, you may be looking for more light for the kitchen. Fairy lights will help set the ambiance of your room, being bright enough to light up and draw attention to an area of your kitchen without being harsh on your eyes. Place some battery powered fairy lights in some old large jars and dot them around your kitchen to add magical spots of lights. Christmas Wreath – Add a Christmas wreath to the centre of your kitchen window or on your kitchen door to add a truly festive theme in an instant. To make your own, it’s simple. Tape each end of a pipe insulator together (or swimming noodle if that’s more accessible) and start gluing large baubles to it using a glue gun. Once the majority is covered, glue smaller baubles in the open spots so you can’t see any more foam. You’ll have a colourful and very professionally finished wreath that matches your theme in no time at all. There’s a definite chill in the air and winter seems to be well on its way. Leaving your plants and gardening tools outside in the blustery winter weather can lead to them to becoming damaged. Investing in strong greenhouse staging can help to protect your potted plants and equipment from the harsh elements. Greenhouse staging has a number of uses. 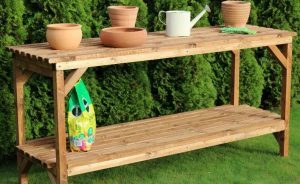 Simply use staging for storage, or make it your work table or potting bench. If you need somewhere to keep all your plants this winter, buying heavy duty greenhouse staging ensures it will remain in your shed or greenhouse for a very long time. No varnishing or additional maintenance required! Not only is greenhouse staging incredibly practical, it also looks rather nice. Made from high-quality Scandinavian timber, greenhouse staging will make your shed or greenhouse look incredibly tidy. The timber used to create greenhouse staging has been treated with a protective solution which prevents damage from water occurring. 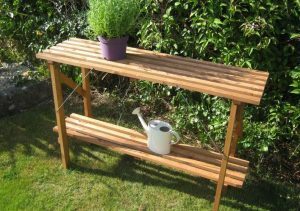 You might be thinking that you could seal wooden staging yourself with a bottle of sealant from your local DIY shop. Wood sealants can be expensive to buy if you’ve got a lot to cover, and many brands are toxic to use, due to strong chemicals and the fumes that they produce. Purchasing a heavy duty greenhouse staging saves you the hassle and allows you to avoid doing this completely. For outdoor storage, lifetime storage boxes offer great protection for all your seasonal equipment and décor. These double-walled polyethylene boxes are waterproof and weather resistant, ideal for keeping outdoor toys or décor in until the warm weather returns. You can also attach a secure padlock to these outdoor storage boxes, should you need to keep valuable garden equipment in them. With sizes ranging from 300 to 500 litres, there’s plenty of space in these boxes! When designing your bathroom, you need to consider the existing space and plan around it. Working with a small space doesn’t mean your bathroom can’t look amazing; you just need to do a bit more planning. RN Williams offer a huge range of bathroom suites and a personalised design service for bathrooms in North Wales. Here are a few things to consider if you are thinking about giving your bathroom a bit of a makeover this year. 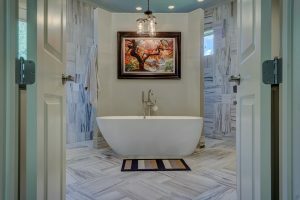 Freestanding bath tubs look aesthetic, but can take up too much valuable space in smaller bathrooms. For small bathroom spaces, decide whether you prefer a bath or shower – having both options can waste valuable space, and makes a small bathroom feel even more cramped. Choosing the right sink can also be important, as you want a sink which comfortably fits your height. Opting for a corner sink can also help to add room to small bathrooms. Bathrooms can quickly become damp, especially if there is limited window ventilation in the room. Damp and mildew not only looks unattractive, it can also pose quite serious health issues if it is not dealt with. If limited window ventilation is a problem that you’re facing – invest in a good quality fan to ensure that excessive moisture is removed effectively. If, like most people, you have too many hair and skin products that you don’t really want displayed – consider having some storage installed. This will keep your bathroom looking uncluttered and more spacious. To maximise space and style, select vanity furniture to hide your abundance of half-used cosmetics. Some vanity units feature a basin, perfect for small bathrooms that require additional storage. Some design choices can give the illusion of a bigger bathroom. Light, neutral wall and floor colours can help make small bathrooms appear more airy and expansive. Installing a large mirror in your bathroom can create the illusion of a bigger space. Solar Roofing – Renewability from the Future!